This fine porcelain plaque, showcasing an exceptional level of attention to detail, replicates an important altarpiece by the Renaissance master Raphael. 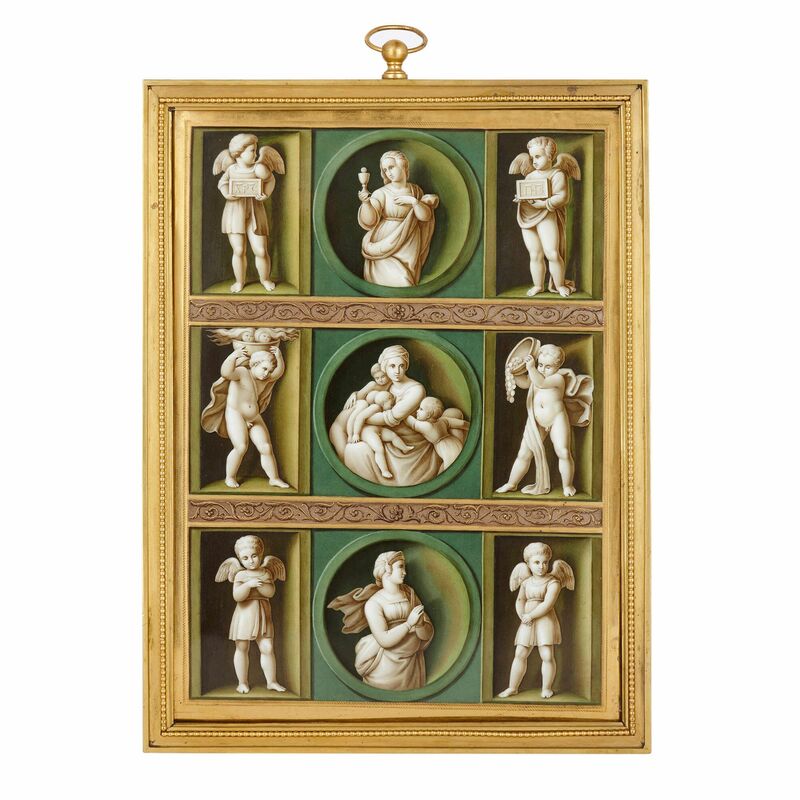 This fantastic porcelain plaque takes after Raphael's famous 'Deposition' altarpiece, also known as the Pala Baglioni, which he completed in 1507. The altarpiece was originally commissioned by Florentine noblewoman Atalanta Baglioni in memory of her murdered son; and the completed version consisted of a central panel, known as The Entombment, together with several panels above and below. 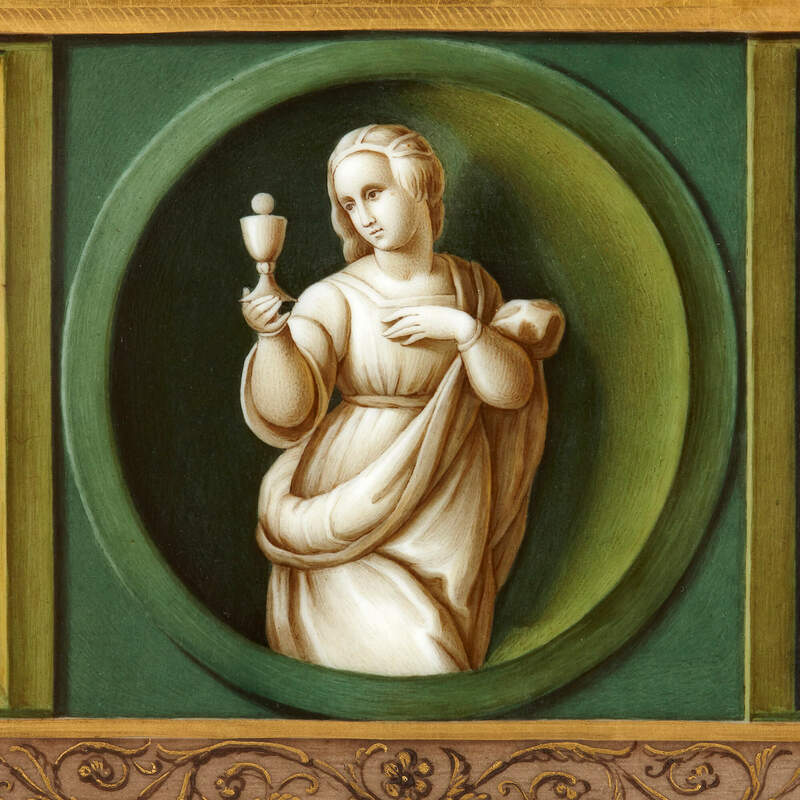 The lower panels, known in Renaissance painting as the predella, were decorated with grisaille depictions of the Theological Virtues. It is these panels which the present plaque imitates. During the French Revolutionary Wars of the 1790s, Raphael's altarpiece was one of a number of paintings looted and taken to France. 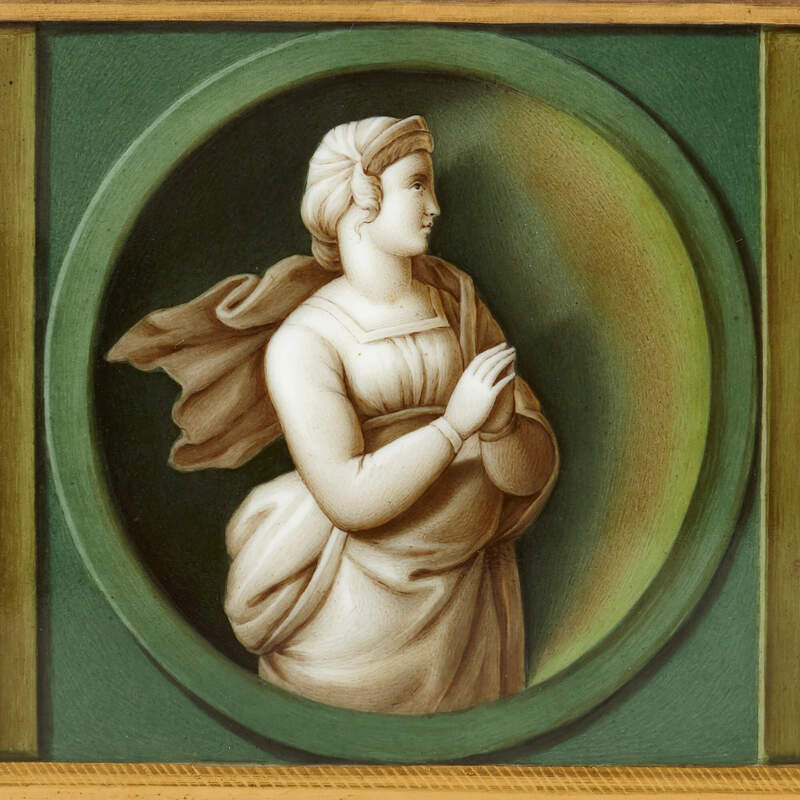 It was around this time that the porcelain artists at the Sevres and Paris porcelain workshops made a number of copies on porcelain of the Deposition panels; and it is therefore likely that this piece, dating from around this time, was made in France (though it could also be Russian). The altarpiece was finally returned to Italy in 1815; and the predella panels can now be found in the Vatican Museum, while The Entombment hangs in the Galleria Borghese. 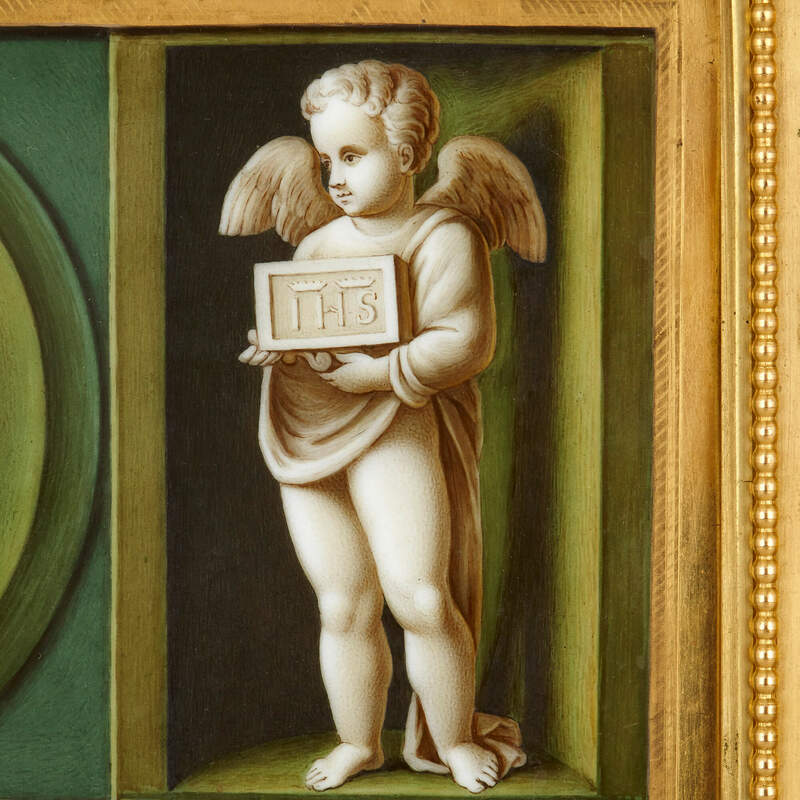 This plaque is divided into three compartments, after the original predella panels. 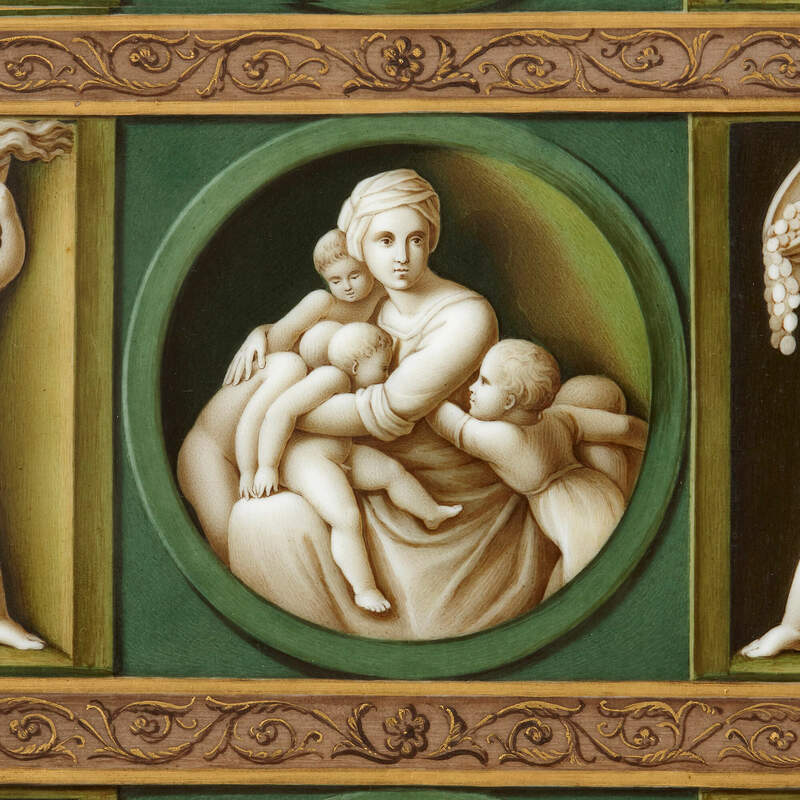 Each compartment represents one of the Theological Virtues (Hope, Charity, and Faith), qualities which in traditional Catholic Christianity, are believed to lead to salvation. The top panel represents Hope, and shows a woman holding a torch; while the middle panel represents Charity and shows a mother with her children; and the bottom panel represents Faith, and shows a woman with her hands held together in prayer. 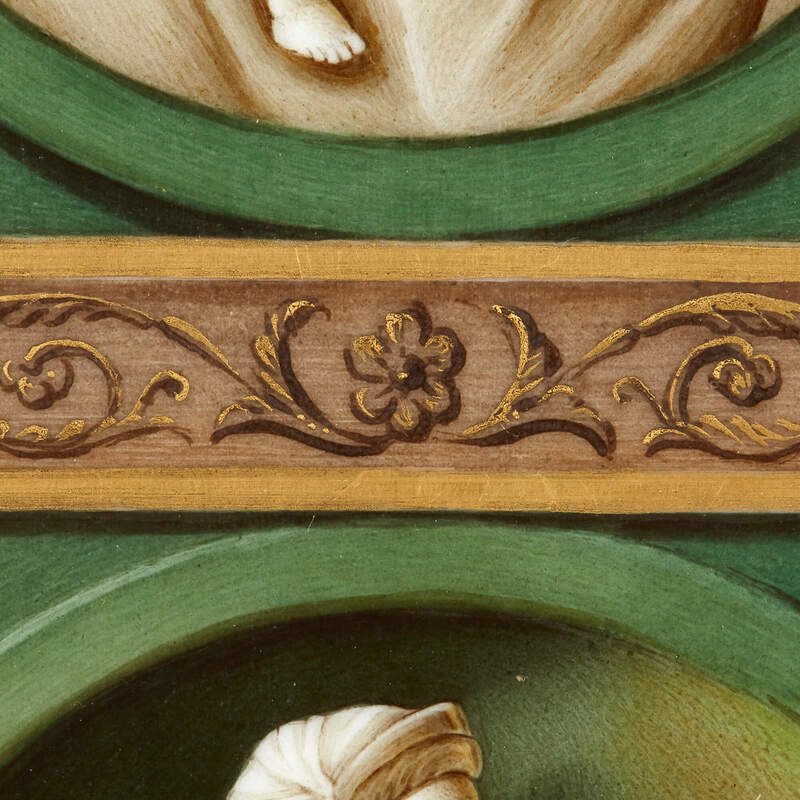 Each central figure is flanked by a winged putto at either side. All of the paintings are rendered in grisaille or monochrome on a green ground. The compartments are divided by foliate scrollwork borders, and the plaque is set inside an ormolu frame with a hanging loop at the top.